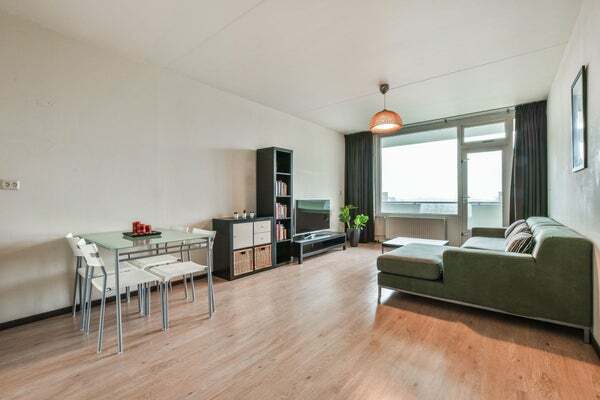 Neat two-bedroom apartment with practical layout and a beautiful view! This 3-room apartment is located in the middle of the greenery, on the seventh floor of a completely renovated (2006) apartment complex. The apartment has a kitchen on the street side. In the living room of the house is a nice laminate floor. The living room offers access to the sunny balcony (approximately 10 m²), located on the southeast with an unobstructed view of the park and the water. The bathroom has a shower and sink. Separate toilet. This apartment has 2 bedrooms, one with access to the balcony. The complex is located on the Bijlmerdreef, about 100 meters from the Ganzenpoort shopping center and Ganzenhoef metro station. In addition to the Bijlmer meadow (2-minute walk) with children's farm and the Diemerbos, you are also provided with all comforts in the area. Think of schools, shops, recreation, roads and public transport. Right next to Grubbehoeve is the Cultural Educational Center (CEC). A center with training opportunities, a gym, daycare center and catering. Right next to this center is free parking for around 200 cars. There is also an underground garage under the CEC that can be used for a fee.